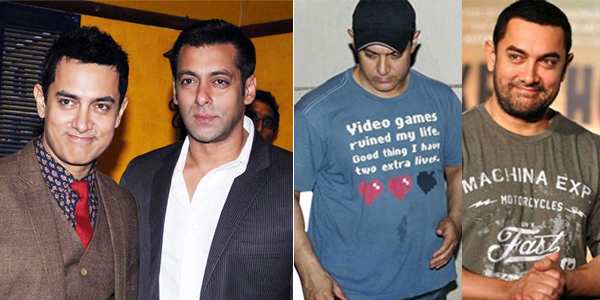 Raaga.com: Salman Khan has taken the responsibility of bouncing ‘overweight’ Aamir Khan back in his original physique! Salman Khan has taken the responsibility of bouncing ‘overweight’ Aamir Khan back in his original physique! Ever since Aamir Khan has beefed up his body to 95kg for his upcoming movie DANGAL there is anxiety among his fans about his health. In fact Aamir Khan himself in a press meet had informed media that his family too is quite frightened about his overweight. "My mom and my wife are very worried about my health as they feel I am playing with my health. Even I feel the same," Aamir Khan had confided a few months back! Recently at a fitness event Salman Khan, adored for his physique and healthy lifestyle, was especially invited to share fitness secrets with youngsters. During the interaction with the youths a youngster posed Salman Khan a question that the actor who would need fitness training most gravely was Aamir Khan looking at the way he had inflated his physique for his role in DANGAL. The reason why Salman Khan is so sure of Aamir Khan bouncing back to his original shape is because few are aware that in DANGAL Aamir Khan is playing a dual role that of a bulky 90 kilos 50 year old father of two girls and in the second role he is playing an 18 year old young wrestler. Hence for the 18 year old young wrestler he has hired Salman Khan’s fitness trainer Rakesh who will be working laboriously to make Aamir Khan look a lot leaner with perfectly sculpted body.